Three countries, seas of dykes, waves of windmills. 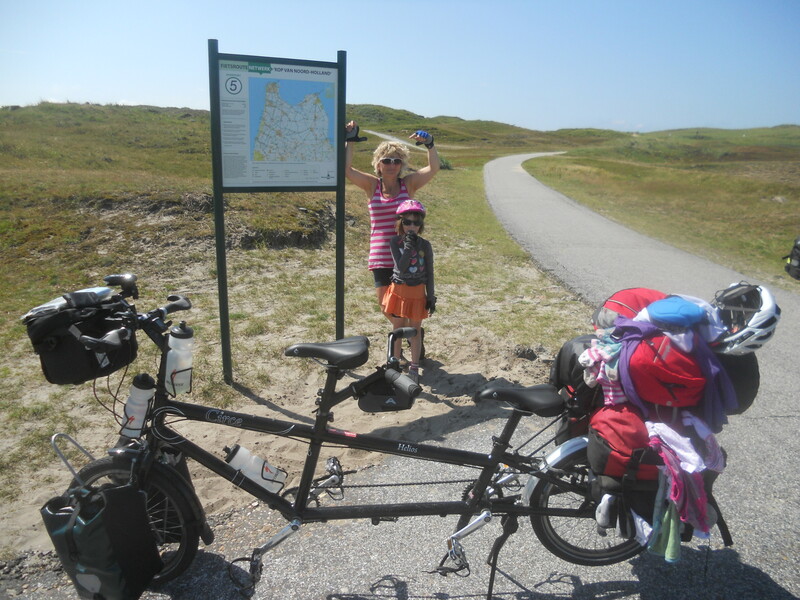 When I last wheeled onto these pages I wrote how my plans to cycle from Land’s End to John o’ Groats with Molly and Daisy had suddenly veered rather dramatically off course: instead of heading for Cornwall we headed for Harwich to catch the ferry to Hoek van Holland. This is because at the eleventh hour my mum expressed her concern at my plan to tow two-year-old Daisy and five-year-old Molly on the back of my bike from one end of this land to the other. Mum liked the idea of the ride but was worried about some of the awful drivers on the roads. 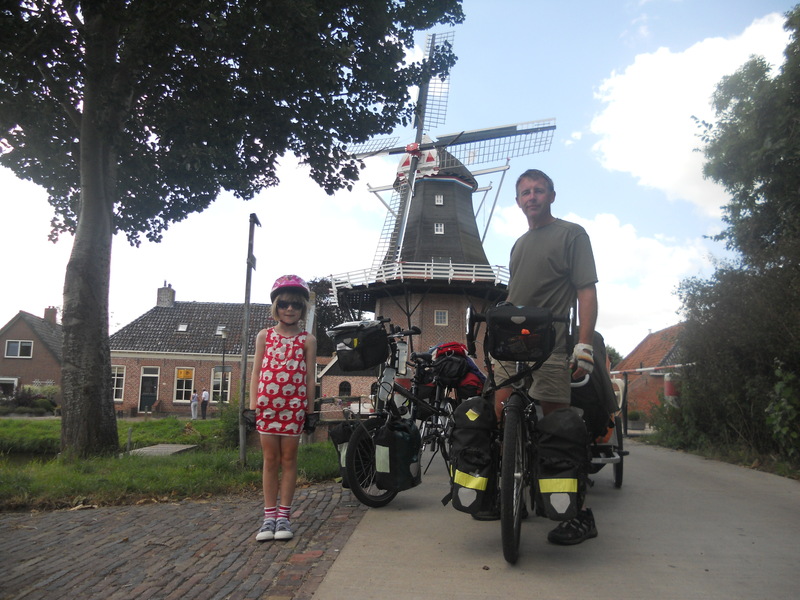 So to lessen her worries I swopped this car-crammed land for bike-filled Holland – and across Holland, Germany and Denmark we cycled. 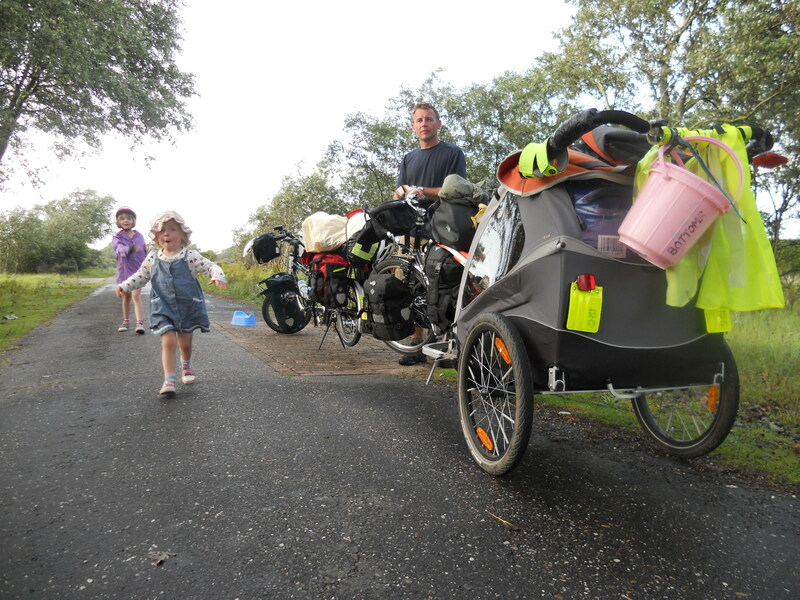 And instead of three of us there was four of us, as back at home while hurriedly sweeping up panniers and tents and sleeping bags and camping stoves and toys and books and buckets and dollies and potties I swept up Gary too to drag along for the ride. I’m not sure he was too happy about suddenly finding himself boat-bound in the middle of the North Sea, but I thought another pair of hands might be useful and what better than your husband’s to join the frenetic fray? 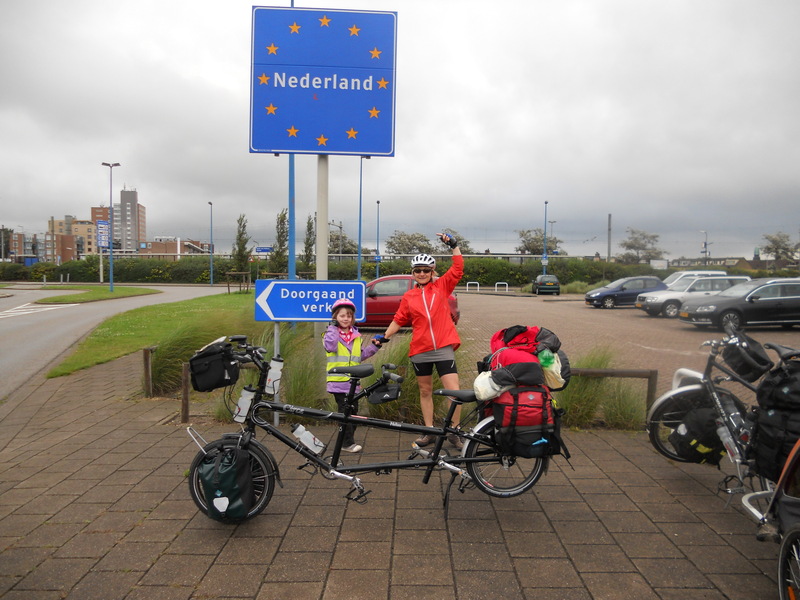 126 croissants, 53 packs of cheese, 30 bags of porridge oats, 180 bananas, 206 bread rolls, 47 tins of mackerel, 94 icecreams, 15 very large thunderstorms, one broken spoke, zero punctures, one birthday (Molly’s) and 787 miles later, we arrived in the Danish port of? Esberg just a few days ago to catch the ferry back to England. For six weeks we lived constantly outside – just cycling and camping. 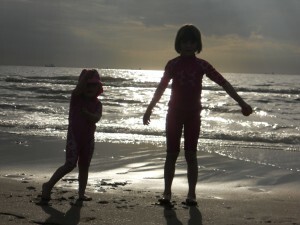 Molly and Daisy looked like grubby urchins and seemed to love every minute.If? 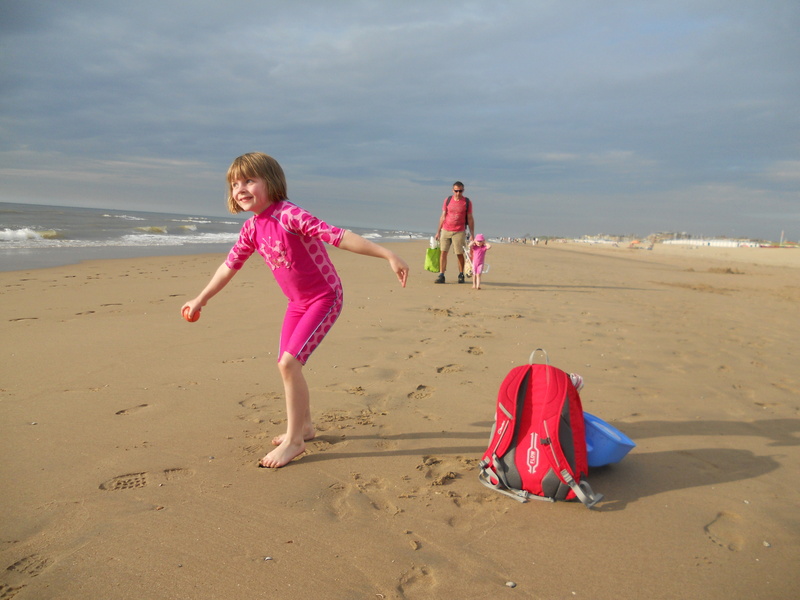 we hadn’t had to put a spurt on to get Molly back to school in time for the beginning of the autumn term (which we missed anyway – we were busy camping and rummaging around in open-air Viking museums at the time) I would happily have kept going on to Sweden, Norway, Iceland and beyond. Long straight cycle paths along long straight dykes along Holland's north-west coast. 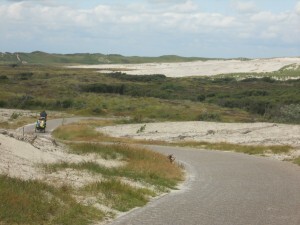 Gary disappearing at speed down a cycle path across the Dutch dunes. 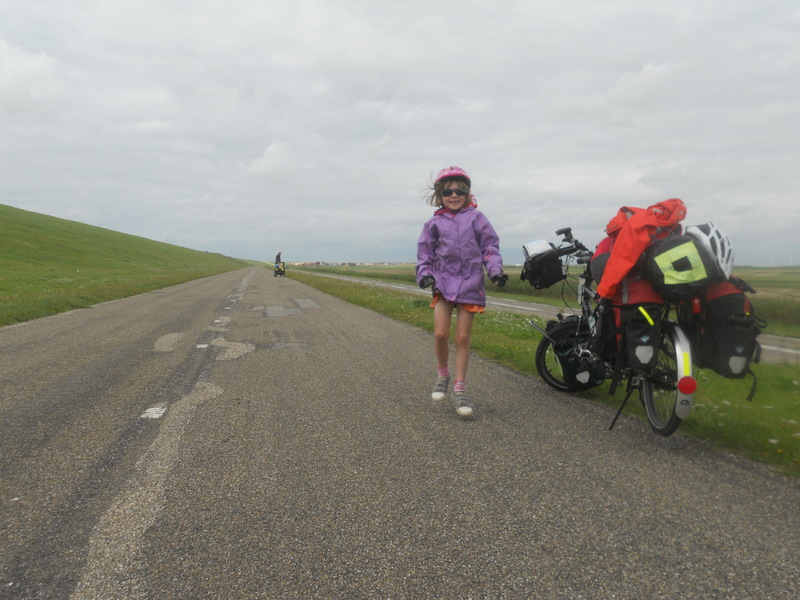 To give Daisy a break from sitting in the trailer we would have regular stops (when she wasn't asleep) and have bike path running races. More bike path running races. And potty stop. 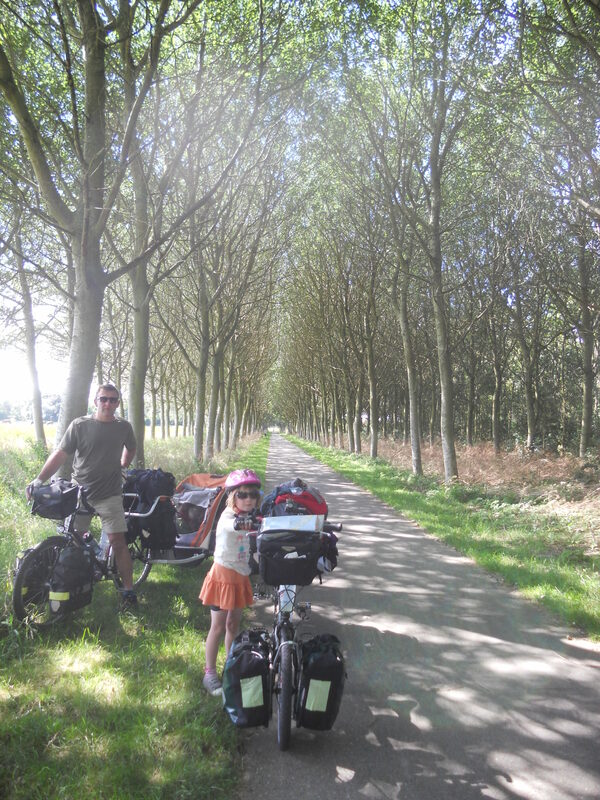 Propped up against one of Holland's many Fietsroute (bike route) maps. Molly standing to attention near a windmill near Winsum. 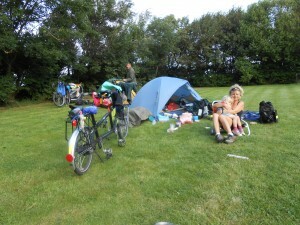 Bikes, bags and tents. Packing up took a very long time! 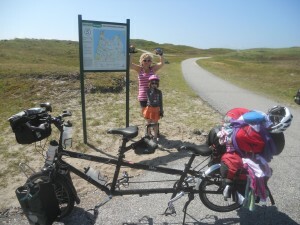 PS: I am still planning to cycle from Land’s End to John o’ Groats next year in some shape or form – probably on my Nihola trike-bike contraption with Molly and Daisy as support in the camper van. Nice one Jose! Looks like the family had a great trip. 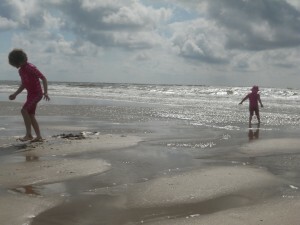 Need to get my arse over to Holland for a trip as it looks great. Can you post up the route you took? Hi Ian, I’m not too sure about posting up routes – I’m a bit backwards on the how-to-do-that technology front. But I could show you on a real map! The route was quite simple – follow the Dutch coast north (with a few island visits to places like Texel and Vlieland) then follow the German coast up to Denmark – and then up the Danish coast to Esberg. I LOVE these photos, it looks like such a fantastic family trip. You’re the definition of ‘loaded’ cycling! What a great way for the children to spend the end of summer – outdoors all the time, on their bikes or running in the fresh air and checking out vikings!! I make excuses all the time for NOT touring with my toddler – I’m feeling inspired!! Great stuff Josie. Glad to see that having a family hasn’t stopped your cycle touring. Gary looks like he enjoyed it too. The folks are truly friendly, I frequently got lost, looking for youth hostels ,only to find them full ! The Weather here in Cornwall can often be fine in October, but don’t tell anyone,if you still are going to do the “End to End” . Glad to hear all went well. The number of tins of mackerel made me smile – can you convert more people to the joy of tinned fish? What camera did you use? Tinned fish? Lovely! As long as it’s not slopping about in tomato sauce – though Gary likes that one. 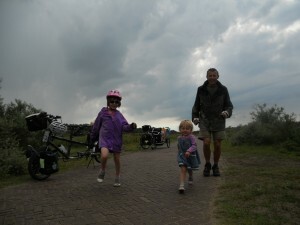 I used a tiny Nikon Coolpix – a great little camera until it fell out of my handlebar bag and then refused to work. But luckily I had a Coolpix back-up! Great trip Josie. 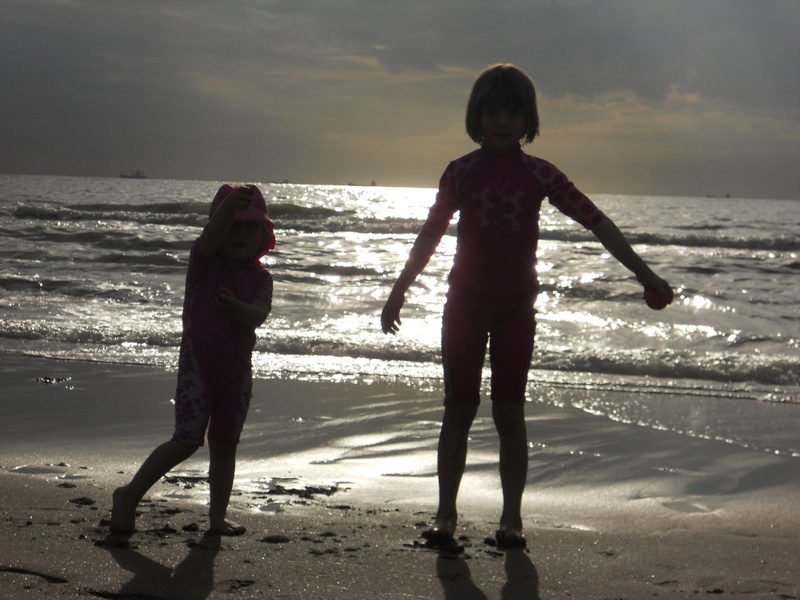 The girls certainly looked like they enjoyed it. The tent in the last picture looks like the NF roadrunner 22. I would be interested to know your opinion of it as ours has practically disintegrated after just about 50 nights use. You’ve identified right – it is the NF Roadrunner 2 (not 22!). Disintegrating after 50 nights doesn’t sound too promising. Mine has lasted several years so far (totalling about 6 months of nights) and seems to work fine. It hasn’t leaked once in torrential downpours and is good in high winds. When the outer of the tent fly is wet it’s a bad design that when you unzip ther outer from the inside, water tends to drip (or pour!) directly onto you as you climb out. I always use a footprint groundsheet with the tent. Maybe disintegrated is too harsh but all of the velcro attachments have pulled off and the seam sealing has just peeled away. I’ve re-attached the velcro ties several times and re-sealed the seams myself to keep the tent going but it’s very disappointing. Maybe we were unlucky. It’s a shame because the tent has some really good points, stability being a particular one. I’ve had seam sealant peel off my North Face Vector 22 tent and my NF Tadpole but so far so still sealed on my Roadrunner. From what I’ve seen and slept in I think Terra Nova make better tents than TNF. I can change it to bananas or trains if that’s any help. Kids in the Camper van sounds really sensible. Living in Cornwall, I can’t see many ways to avoid some “A” road travel .The “A” 30 is miserable ,The “A” 39 from Wadebridge to Camelford very dangerous with many bends and high hedges .With the camper van bringing up the rear you should be safe .I felt very vunerable on my own . 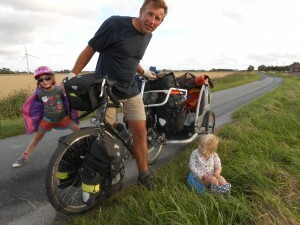 Hey Nigel – When I rode End-to-End with my young family I don’t think we did any A-roads at all in Cornwall – or only a few little bits. With careful map-reading we joined up networks of minor roads with bits of path here and there. It was a whole lot hillier than the main roads, but taking to the hills is what an endangered species does if it’s to survive! But Josie sure knows all about that. In the 1970s my granddad (who was a fireman and tester of fire-fighter machines) was invited onto Jim’ll Fix It to show a young boy how to drive a Pathfinder and put out a fire. Off camera he told my granddad his real name was Oscar Pennyfeather. Loved every one of your books and your road train looks great fun + glad to see you still eating tons of porridge! !